It isn’t easy running a business, especially extended enterprises with complex elements that require logistical support. Enter ServiceNow (NYSE: NOW), a major provider of cloud-based tools that help enterprises run as efficiently as possible. The cloud enables public or private orga­nizations to improve IT capabilities without putting in place infrastructure, adding new personnel or purchasing software. ServiceNow occupies a fiercely competitive field in which considerable cash flow is required to fund continuing research and development. If a company fails to innovate in this space, it will be left in the dust. With powerful technological tailwinds propelling demand for its products, ServiceNow’s stock has enjoyed a terrific run. But is this growth sustainable? Our NOW stock prediction examines the pros and cons of the company and we’ll see what 2019 has in store for shareholders. To make a NOW stock prediction, we first must understand what this company does. With a market cap of $32.8 billion, ServiceNow offers enterprise cloud computing solutions that help manage and automate services for all kinds of businesses. These “service management solutions” are used for customer service, human resources, and security operations. The company’s ServiceNow platform offers data benchmarking, performance analytics, workflow automation, electronic service catalogs and portals, encryption, configuration management systems, and collaboration and development tools. Customer service management software looms large in the company’s menu of products, as well as human resources and security operations products. How Has ServiceNow Stock Performed? Over the past year, NOW shares have gained 29% whereas the S&P 500 has lost 7%. Over the past two years, NOW shares gained 106% whereas the S&P 500 has gained 15%. Over the past five years, NOW shares have gained 193% and the S&P 500 has gained 48%. How Has ServiceNow Stock Performed in 2017/2018? In 2017, ServiceNow shares gained 72% whereas the S&P 500 gained 19%. In 2018, ServiceNow shares gained 29% whereas the S&P 500 lost 7%. To fully gauge ServiceNow’s future prospects, we must look at its competitors. Salesforce is a $117 billion market cap firm that provides enterprise cloud computing solutions focused on customer relationship management (CRM). 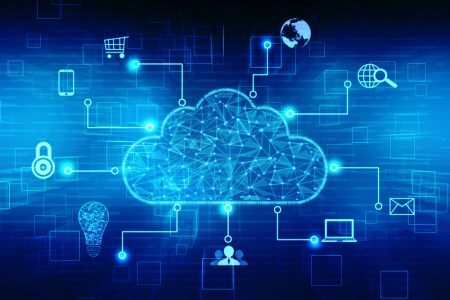 The firm’s Service Cloud product provides companies with the ability to deliver personalized customer service, and even lets companies connect agents, dispatchers, and mobile employees through a centralized platform. That’s the technology that allows a business to track and manage specific jobs in real-time. Marketing Cloud is a tool for businesses to personalize, plan, and optimize customer marketing interactions. Sales Cloud stores data, monitors leads, predicts opportunities, and offers various insights using analytics intelligence. Data base provider Oracle (market cap: $177 billion) has become a dominant brand name in cloud computing. Oracle makes money from the cloud in two main ways. It sells access directly to applications, but it also provides tools to program and manage apps while analyzing data (its “platform” service). This tech giant has successfully transitioned away from its former core offering of installed software to embrace the boom in cloud computing. SAP (market cap: $123 billion) makes products that support business intelligence and analytics. The most advanced businesses need platforms that can analyze and process live data, especially as data arrives from different sources. The company mostly serves Global 1000 Companies that are geared towards doing business in databases, enterprise resource planning, and financial software. SAP’s products permit extensive customization, for the creation of inventory and sales management systems. Salesforce and SAP are major competitors to Adobe (NSDQ: ADBE), which dominates the provision of software for digital publishing and marketing. CRM is a fast-growing industry, which also means it’s brutally competitive. Most of ServiceNow’s competitors have been around for a long time, generate solid profits, tons of free cash flow, and can plow that cash flow back into their businesses. ServiceNow has its hands full with these competitors. That is exactly why the company isn’t generating profits. ServiceNow’s revenues have been growing at a nice clip. Unfortunately, the firm’s selling, general, and administrative expenses have been growing just as fast, along with other operating expenses. Is there any argument to be made that the company is cheap? Let’s see. NOW has a $32.8 billion market cap. The trailing 12-month (TTM) net loss is $60 million, with $2.5 billion in revenue. That means NOW stock is trading at about 13 trailing revenue. Analysts project five-year annualized earnings of 45%, which is easy when you have no earnings to speak of. NOW’s valuation of 13x revenue is very high. Even video streaming firm Netflix (NSDQ: NFLX) only trades at 9x. Fact is, the provision of enterprise software is characterized by Darwinian competition. Here’s a video that provides insights into the industry. ServiceNow stock is expensive based on our price-to-earnings growth (PEG) ratio valuation method. However, let’s get a reality check here. How is the stock valued in relation to its peers? Maybe it seems expensive on an absolute basis but isn’t on a relative basis. Salesforce has a $114 billion market cap. TTM net income was $815 million (after adjusting for a higher 2017 tax bill due to the Trump tax cuts). Thus, Salesforce’s stock is trading for 140x trailing earnings! Analysts project five-year annualized earnings for Salesforce of 33%. We give a 10% premium to that number for each of the following: world-class brand name (no), significant cash hoard (no), and/or robust free cash flow (no). CRM trades at 141x, with a PEG ratio of over 4. Ouch. Very pricey. SAP has a market cap of $123 billion. On $4.21 billion of TTM net income, it trades at around 30x earnings. Analysts’ five-year estimate is for 8.49% growth on an annualized basis. SAP trades at a PEG ratio of almost 4, so maybe NOW isn’t so expensive. Oracle has a market cap of $175 billion. On $11 billion of TTM net income, ORCL stock trades at 16x earnings. How does Oracle rate on our checklist? World-class brand name (yes), significant cash hoard (yes), and/or robust free cash flow (yes). Including the valuation bonuses, Oracle’s five-year earnings estimate is for 13% growth. It thus trades at a PEG ratio of 1.27, which makes Oracle far cheaper than ServiceNow or SAP. Many tech companies in the cloud industry are expensive. But there is one thing that separates them from ServiceNow — they make money. So what’s our verdict on NOW stock? If you look at a one-year price chart of NOW, what you see is a very volatile stock. The last four months of 2018 were particularly choppy for NOW shares. When you put together the market’s instability with the company’s natural volatility, it makes for potential investor heartburn. ServiceNow does enjoy momentum as far as revenue growth is concerned, but the company isn’t making money and the stock is simply too risky. The tech sector is poised for a correction in 2019, an occurrence that would especially punish overpriced and unprofitable ServiceNow.